بیات کشکولی, علی, نیسی, فواد, مقدم نیا, علیرضا. (1394). مقایسه پیش بینی واکشیدگی ضخامت تخته خرده چوب با سیستم فازی و شبکه عصبی مصنوعی. مجله صنایع چوب و کاغذ ایران, 6(1), 53-66. علی بیات کشکولی; فواد نیسی; علیرضا مقدم نیا. "مقایسه پیش بینی واکشیدگی ضخامت تخته خرده چوب با سیستم فازی و شبکه عصبی مصنوعی". مجله صنایع چوب و کاغذ ایران, 6, 1, 1394, 53-66. بیات کشکولی, علی, نیسی, فواد, مقدم نیا, علیرضا. (1394). 'مقایسه پیش بینی واکشیدگی ضخامت تخته خرده چوب با سیستم فازی و شبکه عصبی مصنوعی', مجله صنایع چوب و کاغذ ایران, 6(1), pp. 53-66. بیات کشکولی, علی, نیسی, فواد, مقدم نیا, علیرضا. مقایسه پیش بینی واکشیدگی ضخامت تخته خرده چوب با سیستم فازی و شبکه عصبی مصنوعی. مجله صنایع چوب و کاغذ ایران, 1394; 6(1): 53-66. درصد واکشیدگی یکی از خواص فیزیکی مهم محصول نهایی می‌باشد. این آزمون نیاز به زمان و هزینه دارد. بنابراین پیش بینی مقدار درصد واکشیدگی تخته در حین تولید می‌تواند باعث کنترل کردن فرایند تولید و کیفیت یکنواخت محصول گردد. در این تحقیق متغیرهایی مانند رطوبت خرده چوب قبل از خشک‌کن، رطوبت کیک خرده چوب در فرمینگ، میزان چسب مصرفی به ازای هر تخته، زمان پرس، دمای پرس، فشار پرس، و خاصیت درصد واکشیدگی تخته خرده چوب خط تولید کارخانه دعبل خزاعی جمع‌آوری شد. داده‌های نرمال سازی شده با استفاده از روشهای شبکه عصبی مصنوعی و سیستم فازی بررسی شد و این خاصیت با بهینه ترین مدل پیش بینی شد. بهترین مدل پیش بینی درصد واکشیدگی تخته بر اساس روش شبکه عصبی مصنوعی 5-5 و در سیستم فازی تابع زد شکل با درصد خطای مطلق پیش بینی به ترتیب 5/0 و 22 درصد می‌باشد. روش شبکه عصبی مصنوعی در مقایسه با روش سیستم فازی از کارایی بهتری برخوردار است. Alborzi, M., 2001. Introduction to Artificial Neural Networks. Sharif University press, 137 p. (In Persian). Menhaj, M., 1998. Introduction to Artificial Neural Networks. Hesabi press, 716 p. (In Persian). Esteban, L.G., Fernández, F.G., de Palacios, P. and Conde, M., 2009. Artificial neural networks in variable process control: application in particleboard manufacture. Investigación Agraria: Sistemas y Recursos Forestales, 18(1):92-100. Cook, D. and Chiu, C.C., 1997. Predicting the internal bond strength of particleboard, utilizing a radial basis function neural network. Engineering Applications of Artificial Intelligence, (10)2: 171–177. Bayatkashkoli, A., 2013. Evaluation of process variables effect on the bursting strength of newsprint, printing and writing paper. Journal Indian Academy Wood Science, 10(1):55–61. Jahanilomer, Z., FarrokhPayam, S.R. and Shamsian, M., 2014. An intelligent neural networks system for prediction of particleboard properties. 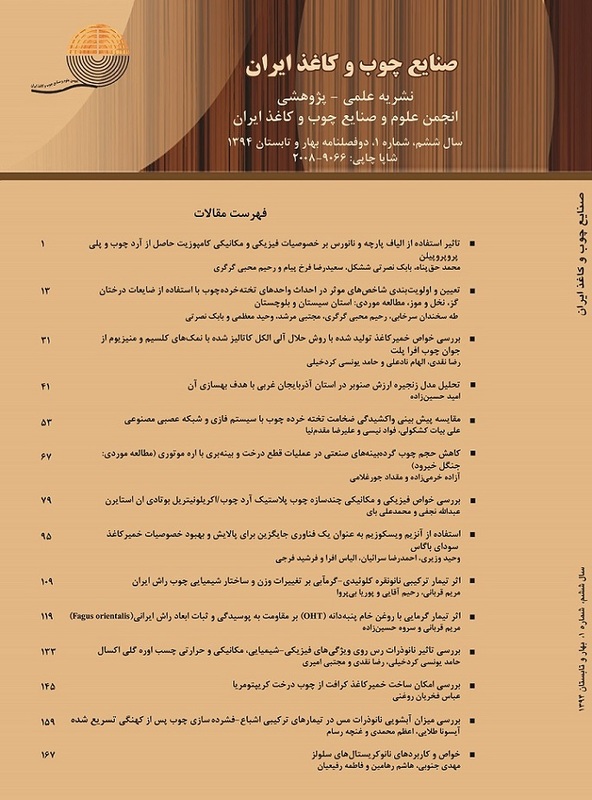 Iranian Journal of Wood and Paper Science Research, 29(2): 242-253. (In Persian). Oduguwa, V., Tiwari, A. and Roy, R., 2005. Evolutionary computing in manufacturing industry: an overview of recent applications. Applied Soft Computing Journal, 5: 281–299. Stefansson, A., Koncar, N. and Jones, A.J., 1997. A note on the Gamma test. Neural Computing and Applications, 5: 131-133. Monte, R.A., 1999. A random walk for dummies. Mit Undergraduate Journal of Mathematics, 1: 143- 148. Yagar, R.R. and Zadeh, L.A., 1992. An introduction to fuzzy logic applications in intelligent systems. Boston, Kluwer Academic Publishers, 356 p.
 Jang, J.S.R. and Gulley, N., 1995. Fuzzy logic Toolbox for use with MATLAB. Natick Mall, Boston, the math works, Inc. 208 p.
 Mamdani, E.H. and Assilian. S., 1975. An experimental in linguistic synthesis with a fuzzy logic control. International Journal Man-Machine Studies, 7: 1-13. Zadeh, L. A., 1965. Fuzzy set. Information and Control. 8:338-353. Dubois, D. and Prade, H., 1980. Fuzzy set and systems: Theory and Application. Academic press. New York, 411 p.
 Malinov, S., Sha, W. and Mckeown, J.J., 2001. Modelling the correlation between processing parameters and properties in titanium alloys using artificial neural network. Computational Materials Science Journal, 21: 375-394. Cheng, C.S., 1995. A multi-layer neural network model for detecting changes in the process mean. Computers and Industrial Engineering, 28: 51-61. Cook, D.F., Massey, J.G. and Shannon, R.E., 1991. A neural network to predict particleboard manufacturing process parameters. Forest Science, 5: 1463-1478. Cook, D.F., Zobel, C.W. and Nottingham, Q.J., 2001. Utilization of neural networks for the recognition of variance shifts in correlated manufacturing process parameters. International Journal Products Resource, 39(17): 3881-3887. Cook, D.F., Ragsdale, C.T. and Major, R.L., 2000. Combining a neural network with a genetic algorithm for process parameter optimization. Engineering Applications of Artificial Intelligence, 13(4):391–396. Esteban, L.G., Garcia Fernandez, F., de Palacios, P. and Gonzalez Rodrigo, B., 2010. Use of Artificial Neural Networks as a predictive method to determine moisture resistance of particle and fiber boards under cyclic testing conditions (UNE-EN 321). Wood and Fiber Science, 42(3): 1-11. Dousthosyni, K. 2001. Production technology and use of wood based panel. Tehran University press, 420 p. (In Persian). Moslemi, A.A., 1974. Particleboard, Volumes 1 and 2. Southern illinois University Press, Carbondale, illinois. 256 p.
 Nemli, G., Zekovic, E. and Aydin, I., 2007. Some of the parameters influencing surface roughness of particleboard. Building and Environment Journal, 40(10): 1337-1340. Nemli, G., Aydin, I. and Zekovic, E., 2007. Evaluation of some of the properties of particleboard as function of manufacturing parameters. Materials and Design, 28: 1169-1176.